Respiratory Institute, The Cleveland Clinic, Cleveland, Ohio. Airway pressure release ventilation (APRV) is inverse ratio, pressure controlled, intermittent mandatory ventilation with unrestricted spontaneous breathing. It is based on the principle of open lung approach. It has many purported advantages over conventional ventilation, including alveolar recruitment, improved oxygenation, preservation of spontaneous breathing, improved hemodynamics, and potential lung-protective effects. It has many claimed disadvantages related to risks of volutrauma, increased work of breathing, and increased energy expenditure related to spontaneous breathing. APRV is used mainly as a rescue therapy for the difficult to oxygenate patients with acute respiratory distress syndrome (ARDS). There is confusion regarding this mode of ventilation, due to the different terminology used in the literature. APRV settings include the “P high,” “T high,” “P low,” and “T low”. Physicians and respiratory therapists should be aware of the different ways and the rationales for setting these variables on the ventilators. Also, they should be familiar with the differences between APRV, biphasic positive airway pressure (BIPAP), and other conventional and nonconventional modes of ventilation. There is no solid proof that APRV improves mortality; however, there are ongoing studies that may reveal further information about this mode of ventilation. This paper reviews the different methods proposed for APRV settings, and summarizes the different studies comparing APRV and BIPAP, and the potential benefits and pitfalls for APRV. A: Pressure (green) and volume (black)/time curve in airway pressure release ventilation (APRV). 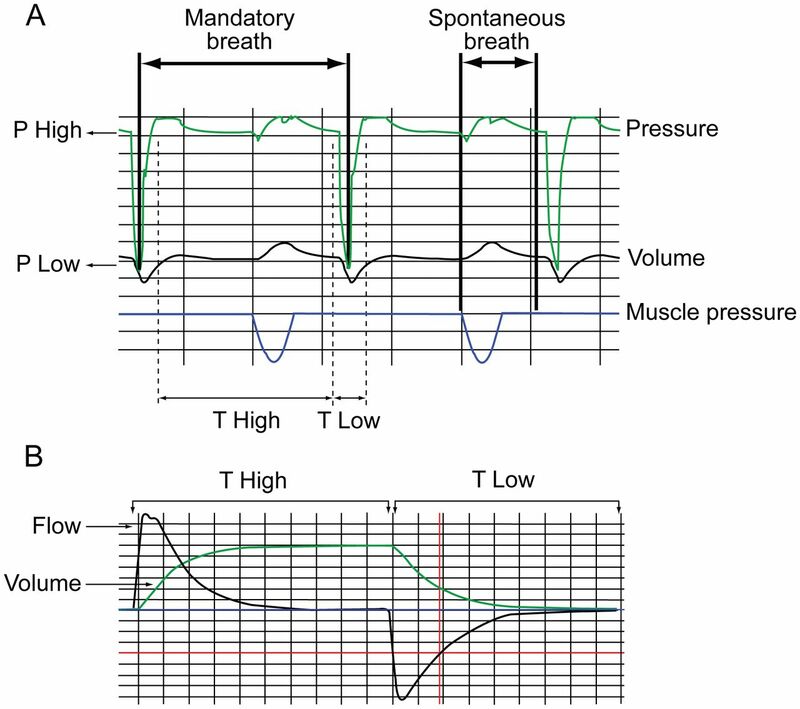 Shown in the figure: 2 full mandatory breaths (not triggered by muscle effort), and 2 full spontaneous breaths (triggered by muscle effort, in blue) on the top of the mandatory ones. Muscle pressure (blue): the long arrow represents the T high, and the short one represents the T low of the mandatory breath. B: Flow (black) and volume (green)/time curve in APRV. T high is the start of the inspiratory flow to the start of expiratory flow, T low is the start of expiratory flow to the beginning of the next inspiratory flow. The 2 red intersecting lines are at 50% of the peak expiratory flow. The confusion regarding this mode of ventilation arises from the different terminology used in the literature, as authors seldom provide adequately explicit definitions for the terms they use when describing various modes of ventilation.11 This issue has been studied by Rose and Hawkins,11 in an attempt to identify the definitional criteria of both APRV and biphasic positive airway pressure (BIPAP) modes. They concluded: “Ambiguity exists in the criteria that distinguish APRV and BIPAP.” The other source of confusion arises from the ventilator manufacturers' choice of terminology. Different names have been coined for the same mode, such as BiLevel (Covidien), APRV (Dräger), Bi-Vent (Maquet), BiPhasic (CareFusion), and DuoPAP (Hamilton). Comparison of airway pressure release ventilation (APRV) (blue curve) and biphasic positive airway pressure (BIPAP) (black curve). Compared to APRV, BIPAP uses shorter T high, longer T low, and usually higher P low. Despite the differences between their settings, mathematically both can achieve the same mean airway pressure (red line) and same tidal volume (green curve). Blue curves represent APRV, black curves represent BIPAP. A recent review of 50 published studies of both modes11 showed that 78% of the studies described APRV, while 22% described BIPAP. Extreme inverse I:E (> 2:1) was used in 46% of the studies describing APRV. None of the studies describing BIPAP used an I:E > 2:1. Twenty-one percent of the APRV studies used I:E of 1:1 to 2:1, compared to 9% of studies describing BIPAP. Thirty-one percent of the APRV studies used I:E of 1:1, compared to 64% of the BIPAP studies. Finally, only 5% of the APRV studies used I:E less than 1:1, compared to 27% of the BIPAP studies. The mean reported inspiratory time (T high) was 3.4 seconds for APRV, compared to 2.4 seconds for BIPAP. Conversely, the mean reported expiratory time (T low) was nearly 3 times longer in the BIPAP studies, compared to APRV (3.4 s and 1.3 s, respectively). The mean P high used in the APRV studies was 6 cm H2O higher, but not statistically significant, compared to the BIPAP studies. Several studies15–22 have compared APRV to conventional mechanical ventilation in humans with ALI/ARDS, but most of them are weakened by the small number of patients and by being short-term observations studies. Consistently, most of them have shown improvement in oxygenation, but none of them has shown mortality benefits in the APRV group. Putensen and colleagues18 randomized 30 trauma patients to either APRV or pressure controlled continuous mandatory ventilation (PC-CMV); they have shown that the APRV group had shorter ventilator days (15 vs 21) and ICU days (23 vs 30). According to the authors, those findings were explained by the improvement in hemodynamics and the less sedation and no paralytic agents used in the APRV group. This study is weakened by the small number of patients (15 in each group), by the fact that only 20% of the APRV group had ARDS, compared to 74% in the PC-CMV group, and by the fact that the 2 groups had different sedation protocols. A recent retrospective study23 with a small number of patients, compared APRV to volume controlled intermittent mandatory ventilation (VC-IMV); beside improved oxygenation, it showed a trend to lower mortality in the APRV group, but did not reach statistical significance. A larger international retrospective study7 using propensity score to compare both APRV and BIPAP to conventional ventilation confirmed the significantly improved oxygenation with both modes, but failed to show any mortality benefits. A recent study24 in 63 adult trauma patients requiring mechanical ventilation for greater than 72 hours showed that APRV has a similar safety profile as the low tidal volume ventilation. APRV patients tended to have increased ventilator days (10.49 ± 7.23 d vs 8.00 ± 4.01 d), ICU stay (16.47 ± 12.83 d vs 14.18 ± 13.26 d), and ventilator-associated pneumonia (VAP) (1.00 ± 0.86 vs 0.56 ± 0.67). This may be explained by the significant initial worse physiologic derangement demonstrated by Acute Physiology and Chronic Health Evaluation II (APACHE II) scores in the APRV group (20.5 ± 5.35 vs 16.9 ± 7.17). APRV shares some similar features with other non-conventional modes of ventilation (eg, inverse ratio ventilation, and high-frequency oscillatory ventilation [HFOV]).25–27 These modes attempt to improve oxygenation by increasing the mean Paw. Inverse ratio ventilation, either with volume or pressure control, increases the mean Paw through increasing the inspiratory time with I-E ratio more than 1:1. This causes patient discomfort, and heavy sedation or muscle paralytics may be required.26,27 HFOV also uses the open lung approach by applying very low tidal volume (potentially less than the anatomic dead space), using high-frequency oscillations around a high mean Paw.25 Heavy sedation and muscular blockers are usually required during HFOV in adults, due to the inability of the only commercially available device (in the United States) to accommodate spontaneous breathing adequately.28 A detailed description of those modes is beyond the scope of this review. Table 1 highlights some of the differences between conventional ventilation (volume or pressure control), inverse ratio ventilation (volume or pressure), BIPAP, APRV, and HFOV. There has been no consensus in the literature in regard to setting APRV parameters, which continues to be a conundrum in clinical practice.32 We will discuss the various methods described and recommended in the literature for setting the P high/P low and the T high/T low, with their advantages and disadvantages. Of note, the most studied but the most difficult parameters to set were the P low and T low.33 There are generally 2 schools of thought, one advocating a short T low with a P low of zero cm H2O to prolong the inflation:deflation ratio and create auto-PEEP, while the other school is to use longer T low to eliminate the auto-PEEP and use a higher P low to avoid alveolar collapse. There are very few data to support either school of thought.8,32 In theory and mathematically (see Fig. 2) both strategies may be equivalent. In this review we will not make any recommendations on how to set the parameters, as there are no solid data to support them. Some authors4,12,18,34 recommended constructing a patient pressure-volume curve, and subsequently setting the P high below the upper inflection point (UIP), and the P low above the lower inflection point (LIP) of the inspiratory limb of the curve to avoid VILI. This method theoretically makes the most physiologic sense and has been studied extensively in conventional mechanical ventilation.35 However, clinicians are faced with the technical difficulties of obtaining a clear curve, and patients often have to be heavily sedated or paralyzed to obtain a passive breath.36 Moreover there is controversy in the literature regarding the benefits of this method in determining the optimal PEEP,37 as well as how to interpret the pressure-volume curves (ie, using the inspiratory38 or expiratory limb39 or the hysteresis of the curve40,41). New ventilators (eg, Hamilton G5 and Dräger Infinity) have integrated software tools that facilitate this task. Other authors1 have set the P high and P low according to oxygenation and ventilation parameters. This method is totally empirical and discouraged, as it does not take into account lung volumes or pressures. Newer research46 has looked into titrating the P low to achieve a protective tidal volume of 4–6 mL/kg, in compliance with the ARDS Network recommendations.43 This method is difficult to achieve in the spontaneously breathing patient, as the effects on the tidal volume during the releases will be variable. Most authors focus on the setting of T low and leave T high as a function of the overall desired frequency of mandatory breaths (usually 8–12 breaths/min). Some authors2,10 have advocated setting the T low according to the expiratory flow curve decay to achieve about 50% of peak expiratory flow as a way to achieve auto-PEEP and avoid lung collapse. This method attempts to create an expected average amount of auto-PEEP. The problem with that method is that the amount of auto-PEEP generated is highly variable and depends on the set P high (assuming P low = 0 cm H2O), respiratory system elastance, and resistance, all of which change frequently during mechanical ventilation. More importantly, this is a difficult task to achieve at the bedside8,32 and the actual level of auto-PEEP is also difficult to measure with most ventilators (Fig. 3). New technology might help facilitate setting T low by allowing the trigger for mandatory breaths to be set as a percentage of the peak expiratory flow, a feature available on the Dräger Infinity ventilator (Auto Release feature). Lung simulator diagram of airway pressure release ventilation (APRV): volume (yellow), lung pressure (white), and flow (orange)/time curve. Time constant (TC) was known and the T low was set to more than 4 TCs. The blue vertical lines represent each TC. 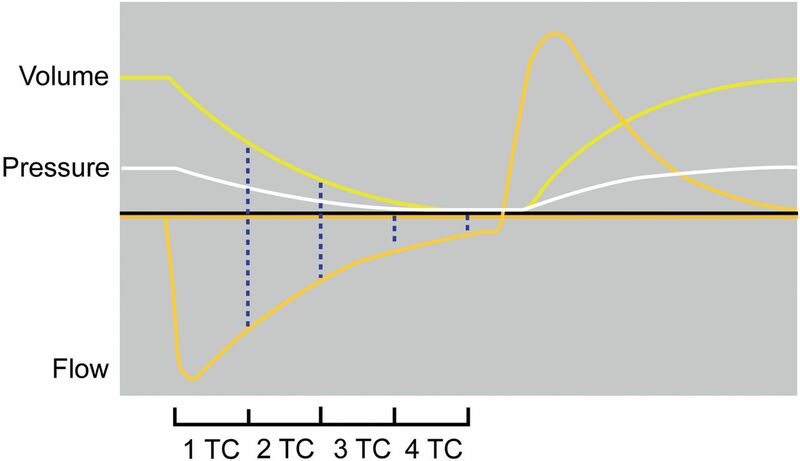 Intrinsic PEEP at each TC would be equal to the point intersecting with the pressure curve, or can be calculated as the end-expiratory lung volume divided by respiratory compliance. Notice that at each TC the flow curve did not decay to 36.2% from its previous value, as expected per the mathematical model. Others have advocated setting the T low according to the expiratory time constant (τ) of the respiratory system.10,31 The time constant is calculated as the product of the static respiratory compliance and resistance, both of which are easily obtained at the bedside. This method allows a theoretical estimate of the amount of auto-PEEP generated (Fig. 4). Pressure, volume, and flow all decay according to the same time constant (assuming a simple, single-compartment model of the respiratory system). During each time constant, each variable changes by 63.2%. Thus, for example, after one time constant, alveolar pressure is 36.8% of its initial value; after 2 time constants it is 13.5%, after 3 time constants it is 5%, and after 4 time constants it is 1.8%. Therefore, if the P high is 30 cm H2O, P low is 0 cm H2O, and the T low is set at one time constant, then the expected auto-PEEP is about 11 cm H2O, 4 cm H2O at 2 time constants, 1.5 cm H2O at 3 time constants, and so on theoretically till infinity if no breath follows. Usually 4–5 times the expiratory time constant is needed to eliminate auto-PEEP.31,36 Unfortunately, such estimation has been shown to be very inaccurate, probably due to the fact that the model does not account for the effect on the time constant of the mechanical properties of the expiratory limb of different ventilators45 (Fig. 5). Caution has to be exercised, as the time constant changes frequently during mechanical ventilation and a guaranteed alveolar pressure may not be maintained.8 Another concern is that even with very short T low, alveolar derecruitment may occur.47 Nevertheless, in a neonatal sheep model of ARDS, Martin and Wetzel48 found that release times of 2–3 time constants maintained adequate oxygenation and ventilation. Another study, by Neumann and colleagues,49 has shown that T low less than 1.5 seconds has resulted in lower tidal volumes, but the V̇E was maintained, with the parallel increase of spontaneous respiratory rate. 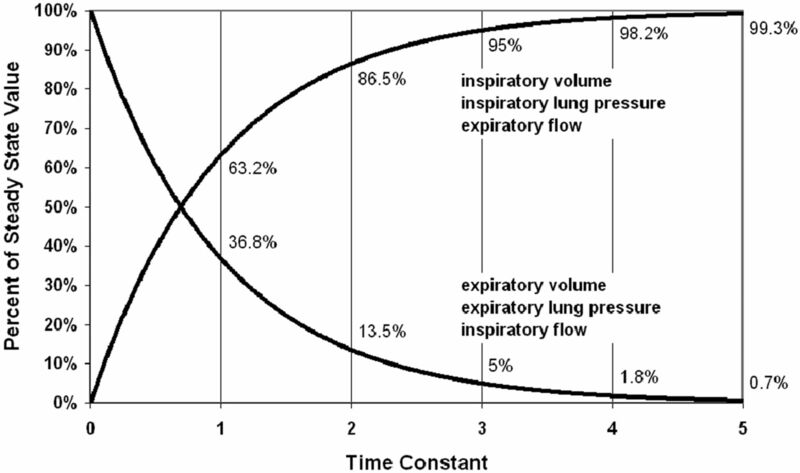 Illustration of the values of the inspiratory and expiratory volume, pressure, and flow in relation to the time constant theory. Each 1 time constant, the volume, pressure and flow change by 63.2% from their previous value. Some authors2,10 have published guidelines for the initial settings of APRV, and they recommended a T low range of 0.2–0.8 seconds. Setting the T low as high as 0.8 seconds in ARDS, whose time constant is usually very short, may cause alveolar collapse and derecruitment, which might be dangerous, especially if the P low used is zero cm H2O. Others46 have looked at titrating the T low to achieve certain predefined protective tidal volume. Conceptually, this method tries to accomplish a protective lung strategy. Unfortunately, the tidal volume will vary with patients' efforts, and changes in lung mechanics. Most of current commercially available ventilators have incorporated the addition of pressure support (PS) and automatic tube compensation (ATC) to augment the patient's spontaneous breaths or to overcome the artificial airway resistance. Experts2,8,10 have expressed their concerns about those adjuncts because the additional elevation of applied pressures may significantly raise the transpulmonary pressure above safe levels, contributing to VILI when the assist is delivered during the P high. Additionally, that support may eliminate the transient drop in transpulmonary pressure created by unassisted spontaneous breaths and thus obviate their putative beneficial effects. Some authors10,33 have described a “drop and stretch method” of weaning APRV; they gradually reduced the level of P high (“drop”) and reduced the number of releases by increasing the T high (“stretch”) until the mode is converted to CPAP as a method of spontaneous breathing trial before extubation. A study by Rathgeber and colleagues51 compared duration of weaning between BIPAP, VC-IMV, and volume controlled continuous mandatory ventilation (VC-CMV) in postoperative cardiac patients, and reported a small yet significant reduction in time on mechanical ventilation. To our knowledge there are no published studies comparing APRV to conventional weaning methods like pressure support ventilation (PSV) or T-tube, or to newer closed loop ventilation methods such as ATC, proportional assist ventilation (PAV), adaptive support ventilation (ASV), or Smart Care. APRV is considered an “open lung approach,” a concept of maximizing and maintaining alveolar recruitment throughout the ventilatory cycle by potentially ventilating the lung on the steep portion of the pressure-volume curve, thus avoiding over-distention on inspiration and alveolar collapse on exhalation.6,10,30 Its major advantages over other modes of conventional ventilation are the preservation of spontaneous unassisted ventilation throughout the entire ventilatory cycle, maintenance of relatively long inflation time, and potential lung-protective benefits. Spontaneous breathing, accounting for 10–30% of V̇E during APRV, leads to improved ventilation-perfusion matching, decreased intrapulmonary shunt, and decreased dead space, through improvement of transpulmonary pressure in the juxtadiaphragmatic lung regions, with alveolar recruitment, and without raising peak Paw.52–55 This is in contrast with conventional ventilation, which leads to alteration of normal ventilation distribution and atelectasis in dependent lung areas.53,56 Furthermore, regular spontaneous breathing maintains diaphragmatic muscle condition. Putensen and colleagues18 have documented the benefits of spontaneous breathing during APRV, which has increased the respiratory-system compliance, PaO2, cardiac index, and oxygen delivery, compared to patients who were paralyzed during mechanical ventilation. 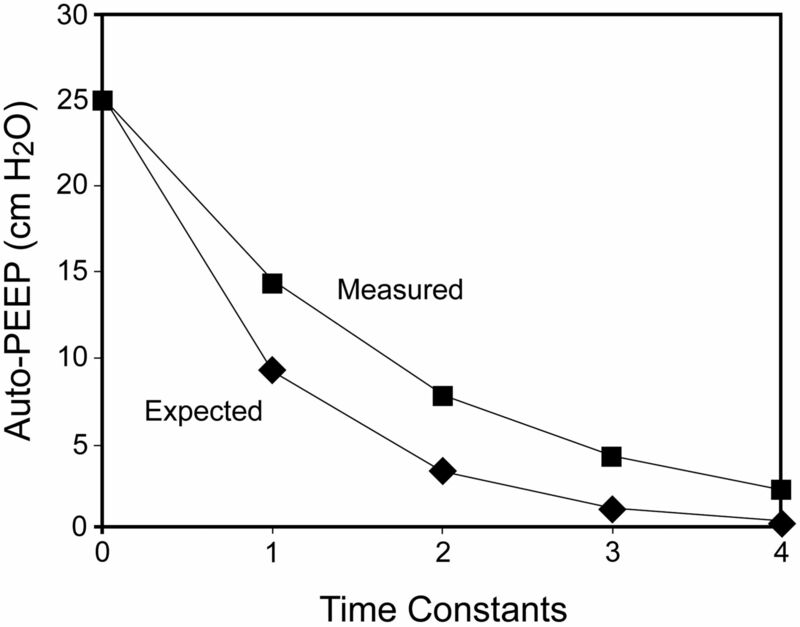 Lung units with reduced compliance have short time constants, thus inflating and deflating rapidly. Lung units with normal compliance have relatively long time constants, thus inflating and deflating slowly.31,36 A prolonged T high is presumed to achieve the treatment goal of alveolar recruitment because it allows time for slow lung units in a non-homogenous lung field to inflate. Furthermore, longer inflation times promote collateral ventilation through the channels of Martin, the pores of Kohn, and the canals of Lambert.71–73 Thus, the longer the inflation time, the greater the lung areas potentially available for gas exchange. The higher mean Paw created with T high and short T low settings presumably results in higher mean lung volumes. To attain the same mean Paw with conventional volume controlled ventilation requires either larger tidal volume with the higher risk of volutrauma,31,43 prolonged inspiratory time as in inverse ratio ventilation that usually requires high levels of sedation along with the risk of hemodynamic compromise and auto-PEEP,74 increased respiratory rate with the risk of VILI secondary to cyclical alveolar opening and collapsing,29 or the addition of higher levels of PEEP. Such strategy had been a matter of debate for a long time. Three recent trials75–77 have documented improved oxygenation with higher PEEP, but no survival advantages, compared to lower PEEP levels. No reported studies have shown improved mortality with APRV use.7,18,19,22 One small retrospective study23 of 58 patients has shown a trend toward mortality benefit: 31% in the APRV group, compared to 59% in the SIMV group (P value of .05). There is a concern that patients with left ventricular dysfunction may not benefit from the augmentation of venous return and the increase in afterload occurring with the decrease in intrathoracic pressures.55 There is also the theoretical concern for using APRV in patients with COPD who require prolonged exhalation time, though there are no conclusive data.8,10 The limited research and experience with this form of ventilation can be a potential problem in certain facilities, though this mode is now integrated on most new commercially used ventilators. The lack of proven mortality reduction has been a factor in the slow adoption of this mode, but there is an increasing interest. There are ongoing studies registered in the National Institutes of Health (clinicaltrials.gov), mostly comparing APRV to low tidal volume ventilation as a lung-protective strategy, which hopefully may shed more light on this mode and answer some of the needed questions. Despite increasing evidence of improving oxygenation, hemodynamics, patient comfort, and safety, there are still a lot of unanswered questions regarding this unconventional mode of ventilation. In the United States the lack of proof that APRV in ALI/ARDS improves mortality has kept this mode in the shadows as a primary ventilatory mode, and it is only thought of as a rescue therapy for the difficult to oxygenate patient. More work and well organized studies seem prudent for the continued use and the acceptance of APRV in day-to-day clinical practice. © 2012 by Daedalus Enterprises Inc.
. Airway pressure release ventilation. Crit Care Med 1987;15(5):462–466.
. Applications of airway pressure release ventilation. Lung 2010;188(2):87–96.
. Advantage of spontaneous breathing in patients with respiratory failure. Signa Vitae 2009;4(1):10–13.
. Clinical review: biphasic positive airway pressure and airway pressure release ventilation. Crit Care 2004;8(6):492–497.
. Open up the lung and keep the lung open. Intensive Care Med 1992;18(6):319–321.
. Beneficial effects of the “open lung approach” with low destending pressures in acute respiratory distress syndrome: a prospective randomized study on mechanical ventilation. Am J Respir Crit Care Med 1995;152(6):1835–1846.
. Airway pressure release ventilation versus assist-control ventilation: a comparative propensity score and international cohort study. Intensive Care Med 2010;36(5):817–827.
. Airway pressure release ventilation. J Burn Care Res 2009;30(6):929–936.
. Understanding mechanical ventilators. Expert Rev Respir Med 2010;4(6):809–819.
. Other approaches to open-lung ventilation: airway pressure release ventilation. Crit Care 2005;Med 33(Suppl 3):S228–S240.
. Airway pressure release ventilation and biphasic positive airway pressure: a systemic review of definitional criteria. Intensive Care Med 2008;34(10):1766–1773.
. Airway pressure release ventilation and biphasic intermittent positive airway pressure ventilation: are they ready for prime time? J Trauma 2007;62(5):1298–1309.
. Airway pressure release ventilation and biphasic positive airway pressure: a 10-year literature review. Clin Intensive Care 1997;8(6):296–301.
. Comparison of APRV and BIPAP in a mechanical model of ARDS (abstract). Respir Care 2010;55(11):1516.
. Cardiovascular effects of conventional positive pressure ventilation and airway pressure release ventilation. Chest 1988;93(5):911–915.
. Airway pressure release ventilation. Arch Surg 1993;128(12):1348–1352.
. Long term effects of two different ventilatory modes on oxygenation in acute lung injury. Comparison of airway pressure release ventilation and volume-controlled inverse ratio ventilation. Am J Respir Crit Care Med 1994;149(6):1550–1556.
. Long term effects of spontaneous breathing during ventilatory support in patients with acute lung injury. Am J Respir Crit Care Med 2001;164(1):43–49.
. Airway pressure release ventilation as a primary ventilatory mode in acute respiratory distress syndrome. Acta Anaesthesiol Scand 2004;48(6):722–731.
. Combined effect of prone position and airway pressure release ventilation on gas exchange in patients with acute lung injury. Acta Anaesthesiol Scand 2003;47(5):516–524.
. Preliminary experience with airway pressure release ventilation in a trauma/surgical intensive care unit. J Trauma 2005;59(1):71–76.
. Evaluation of airway pressure release ventilation compared to low tidal volume ventilation in ALI: prospective randomized pilot study. Respir Care 2005;50(11):1511.
. Practical use of airway pressure release ventilation for severe ARDS – a preliminary report in comparison with a conventional ventilatory support. Hiroshima J Med Sci 2009;58(4):83–88.
. A randomized prospective trial of airway pressure release ventilation and low tidal volume ventilation in adult trauma patients with acute respiratory failure. J Trauma 2010;69(3):501–510.
. Current role of high frequency oscillatory ventilation and airway pressure release ventilation in acute lung injury and acute respiratory distress syndrome. Clin Chest Med 2008;29(2):265–275.
. Severe hypoxemic respiratory failure: part 1: ventilatory strategies. Chest 2010;137(5):1203–1216.
. Inverse ratio ventilation in ARDS. Rationale and implementation. Chest 1991;100(2):494–504.
. Allowing for spontaneous breathing during high-frequency oscillation: the key for final success? (editorial) Crit Care 2006;10(4):155.
International consensus conferences in intensive care medicine: ventilator–associated lung injury in ARDS. Am J Respir Crit Care Med 1999;160(6):2118–2124.
. Ventilator-induced lung injury-lessons from experimental studies. Am J Respir Crit Care Med 1998;157(1):294–323.
. How respiratory system mechanics may help in minimising ventilator-induced lung injury in ARDS patients. Eur Respir J 2003;22(Suppl 42):15S–21S.
. Does airway pressure release ventilation offer important new advantages in mechanical ventilator support? Respir Care 2007;52(4):452–460.
. Airway pressure release ventilation: theory and practice. AACN 2001;12(2):234–246.
. Airway pressure release ventilation. Ann Thorac Med 2007;2(4):176–179.
. Variables used to set PEEP in the lung lavage model are poorly related. Br J Anaesth 1999;83(6):890–897.
. Measurments of respiratory mechanics during mechanical ventilation. Hamilton medical scientific library, Rhäzüns, Switzerland 1999;7:103–114.
. The pressure-volume curve is greatly modified by recruirment: a mathematical model of ARDS lungs. Am J Respir Crit Care Med 1998;158(1):194–202.
. Positive end-expiratory pressure in acute respiratory failure. Pathophysiology and practical guidelines. In: Marini JJ, Slutsky AS editors. Physiological basis of ventilatory support. New York: Marcel Dekker; 1998:873–887.
. Best compliance during a decremental, but not incremental positive end-expiratory pressure trial is related to open-lung positive end-expiratory pressure: a mathematical model of acute respiratory distress syndrome lungs. Am J Respir Crit Care Med 2001;163(1):69–78.
. Maximal hysteresis: a new method to set positive end-expiratory pressure in acute lung injury? Acta Anaesthesiol Scand 2008;52(5):641–649.
. Recruitability of the lung estimated by the pressure volume curve hysteresis in ARDS patients. Intensive Care Med 2008;34(11):2019–2025.
. Airway pressure release ventilation increases cardiac performance in patients with acute lung injury/adult respiratory distress syndrome. Crit Care 2001;5(4):221–226. The Acute Respiratory Distress Syndrome Network. Ventilation with lower tidal volumes as compared with traditional tidal volumes for acute lung injury and the acute respiratory distress syndrome. N Engl J Med 2000;342(18):1301–1308.
. Time constant/volume relationship of passive expiration in mechanically ventilated ARDS patients. Eur Respir J 1995;8(1):114–120.
. Auto-PEEP during APRV varies with the ventilator model. Respir Care 2010;55(11):1516.
. Comparison of three methods to set T low on airway pressure release ventilation - a model study. Respir Care 2010;55(11):1571.
. Short expiratory time with pressure-release ventilation are inadequate to prevent alveolar derecruitment in surfactant-depleted lung. Respir Care 2005;50(11):1520.
. Optimal release time during airway pressure release ventilation in neonatal sheep. Crit Care Med 1994;22(3):486–493.
. Influence of different release times on spontaneous breathing pattern during airway pressure release ventilation. Intensive Care Med 2002;28(12):1742–1749.
. Timing of pressure release affects power of breathing and minute ventilation during airway pressure release ventilation. Crit Care Med 1994;22(5):872–878.
. The influence of controlled mandatory ventilation (CMV), intermittent mandatory ventilation (IMV) and biphasic intermittent positive airway pressure (BIPAP) on duration of intubation and consumption of analgesics and sedatives. A prospective analysis in 596 patients following adult cardiac surgery. Eur J Anaesthesiol 1997;14(6):576–582.
. Airway pressure release ventilation in severe acute respiratory failure. Chest 1991;100(2):460–463.
. Spontaneous breathing during ventilatory support improves ventilation-perfusion distributions in patients with acute respiratory distress syndrome. Am J Respir Crit Care Med 1999;159(4):1241–1248.
. Spontaneous breathing improves lung aeration in oleic acid- induced lung injury. Anesthesiology 2003;99(2):376–384.
. Airway pressure release ventilation. In Tobin MJ editor. Principles and practice of mechanical ventilation, 2nd edition. New York: McGraw Hill; 2006:327–334.
. Position and shape of the diaphragm: implications for atelectasis formation. Anaesthesia 1998;53(11):1054–1061.
. Effects of anesthesia and paralysis on diaphragmatic mechanics in man. Anesthesiology 1974;41(3):242–255.
. Effect of interfacing between spontaneous breathing and mechanical cycles on the ventilation-perfusion distribution in canine lung injury. Anesthesiology 1994;81(4):921–930.
. Epidemiology of nosocomial pneumonia: new perspectives on an old disease. Chest 2005;108(Suppl 2):1S–16S.
. Use of airway pressure release ventilation is associated with a reduced incidence of ventilator-associated pneumonia in patients with pulmonary contusion. J Trauma 2011;70(3):E42–E47.
. Breathing affects venous return from legs in humans. J Appl Physiol 1984;57(4):971–976.
. Effects of abdominal pressure on venous return: abdominal vascular zone conditions. J Appl Physiol 1990;69(6):1961–1972.
. Clinical comparative study of airway pressure release ventilation and continuous positive airway pressure ventilation. Zhongguo Wei Zhong Bing Ji Jiu Yi Xue 2005;17(8):481–483.
. Effects of spontaneous breathing during airway pressure release ventilation on cerebral and spinal cord perfusion in experimental acute lung injury. J Neurosurg Anesthesiol 2010;22(4):323–329.
. Effects of spontaneous breathing during airway pressure release ventilation on intestinal blood flow in experimental lung injury. Anesthesiology 2003;99(5):1137–1144.
. Effects of spontaneous breathing during airway pressure release ventilation on renal perfusion and function in patients with acute lung injury. Intensive Care Med 2002;28(10):1426–1433.
. Spontaneous breathing during airway pressure release ventilation in experimental lung injury: effects on hepatic blood flow. Intensive Care Med 2008;34(3):523–527.
. Effects of spontaneous breathing during airway pressure release ventilation on respiratory work and muscle blood flow in experimental lung injury. Chest 2005;128(4):2991–2998.
. Airway pressure release ventilation: a new concept in ventilatory support. Crit care Med (editorial). Crit Care Med 1987;15(5):459–461.
. Does airway pressure release ventilation alter lung function after acute lung injury? Chest 1995;107(3):805–808.
. Collateral ventilation in man. N Engl J Med 1978;298(1):10–15.
. Anatomy and physiology of collateral respiratory pathways. Eur Respir J 1989;2(9):893–904.
. Pathology of the lungs. New York: Churchill Livingstone; 2000:4:35.
. Should inverse ratio ventilation be used in adult respiratory distress syndrome?. Am J Respir Crit Care Med 1994;149(5):1354–1358. ; Lung Open Ventilation Study Investigators. Ventilation strategy using low tidal volumes, recruitment maneuvers, and high positive end-expiratory pressure for acute lung injury and acute respiratory distress syndrome: a randomized controlled trial. JAMA 2008;299(6):637–645. ; Expiratory Pressure (Express) Study Group. Positive end-expiratory pressure setting in adults with acute lung injury and acute respiratory distress syndrome: a randomized controlled trial. JAMA 2008;299(6):646–655. National Heart, Lung, and Blood Institute ARDS Clinical Trials Network. Higher versus lower positive end-expiratory pressures in patients with the acute respiratory distress syndrome. N Engl J Med 2004;351(4):327–336.
. Airway pressure release ventilation during acute lung injury: a prospective multicenter trial. Crit Care Med 1991;19(10):1234–1241.
. Airway pressure release ventilation reduces the increase in bronchoalveolar lavage fluid high-mobility group box-1 and lung water in experimental acue respiratory distress syndrome induced by lung lavage. Eur J Anaesthesiol 2010;27(8):726–733.
. The oxygen cost of breathing in patients with cardiorespiratory disease. Am Rev Respir Dis 1982;126(1):9–13.
. Comparison of oxygen cost of breathing between pressure support ventilation and airway pressure release ventilation. Anaesth Intensive Care 2005;33(2) 218–222.
. Respiratory muscle blood flow and metabolism. In: Roussos C, Macklem PT editors. The Thorax (Part A). New York: Marcel Dekker; 1985:393–429.
. The gastrointestinal tract as a barrier in sepsis. Brit Med Bull 1999;55(1):196–211.
. Patient-ventilator interaction during acute lung injury, and the role of spontaneous breathing: part 2: airway pressure release ventilation. Respir Care 2011;56(2):190–206.
. Exacerbation of acute pulmonary edema during assisted mechanical ventilation using a low tidal- volume, lung-protective ventilator strategy. Chest 1999;116(6):1826–1832.
. Campbell AR, Dicker RA, Katz JA. Mackersie RC. The effects of tidal volume demand on work of breathing during lung-protective ventilation in patients with acute lung injury and acute respiratory disease. Crit Care Med 2006;34(1):8–14. You are going to email the following Airway Pressure Release Ventilation: What Do We Know?